Flying Stick Fighter wants to bring justice to school! 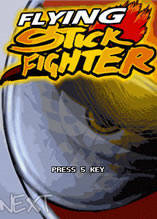 Flying Stick Fighter is a fast and powerful martial art action game. Slip into the role of an ordinary student who wants to restore peace in school. He has not enough power to defend the justice till one day he found a power suit and turns to Flying Stick Fighter. Various attacks like breathtaking flying kicks, speedy punches and hard headbutts make your character perform different moves. Try to overpower the bad styled students and bring justice back to school.